A well exercised husky is a happy husky. The Siberian Husky is a natural athlete. They require exercise in some form. There are many activities to explore with your dog. Learn more about them here. Travel with your dog? This is a great site to visit to find dog parks and more for you and your canine friend! Your source for information and links on mushing, skijoring, pulking, dog-packing, Siberians, Malamutes, Samoyeds, working mutts, and anything else you can think of in the realm of dog-powered recreation or competition. Does Your Dog Love to Run? If your dog loves to run, if you can't walk him enough, if he pulls your arm off, if you would not want your mother or daughter to walk him, if driving to the dog park each night is difficult/boring/expensive, if the Iditarod grabs your imagination, try the new dog sport: dog scootering. Slip your dog into a sled dog harness, rope him to a scooter, hop on the scooter and let him run. The dog and you become a mini mushing team. You ride the scooter; he runs and pulls. Scooter dogs can run for a few city blocks or for 5 to 20 miles on back country trails. You and the dog are a team. 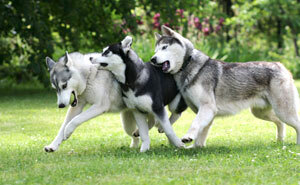 A great list of dog sports and games to play and enjoy with your husky. 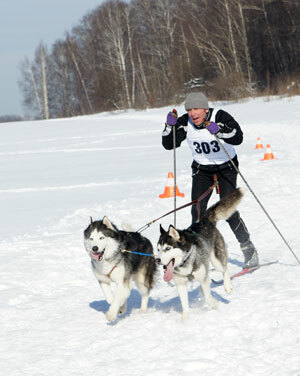 Sled Dog News, Merchandise, Knowledge Center and so much more! A fun site for adults and children alike, this site provides information about how Alaskan Huskies are chosen to be sled dogs, tells the story of Balto, describes the Iditarod, and includes a fun mushing game for the kids. 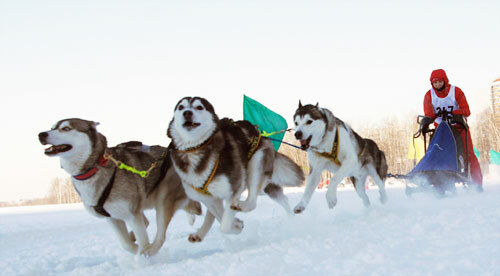 Your on-line source for sled dogs and mushing. Learn more about sledding and where to buy the equipment you need!